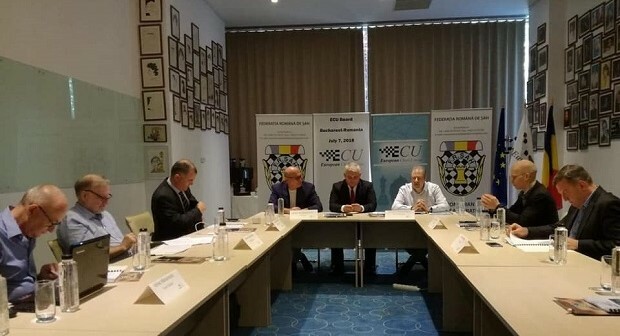 The 2nd European Chess Union Board meeting in 2018 took place on the 7th of July in Bucharest, Romania. The meeting was held under excellent conditions in the Marshal Garden Hotel. The President of the Romanian Chess federation Mr. Sorin-Αvram Iacoban and the ECU Deputy President Mr. Ion Dobronauteanu welcomed the ECU Board members to Bucharest for the second time during the last four years. The accounting report for the year 2017 was presented to the ECU Board and will be included in the ECU GA agenda. The ECU Board decided to set as final deadline for the deposit fees for the 2019 events, the 31 st December 2018. ECU Board was informed that the criminal complaint submitted in Slovenia, concerning the shadow financial operations misusing the ECU identity, is in the phase of investigation and the Slovenian Police has already confirmed and informed officially ECU, that bank certificates were forged. ECU requests to the police authorities to complete the investigation the soonest and proceed with the necessary legal actions against the individuals involved. ECU Board was informed about the new opportunities after the meetings with the European Union officials and a number of actions are scheduled for the coming period. European Chess Union and European Chess Academy arranged a hearing in Brussels, European Parliament on 6th March 2019 about Seniors’ Chess and also the positive effect of chess in various diseases (Alzheimer, dementia..). ΕCU Board approved the candidacies for the ECU elections 2018 and discussed the details about the organisation of the ECU General Assembly scheduled for the 2nd and 3rd of October 2018 in Batumi, Georgia. European Individual Chess Championship 2020 was awarded to the city of Maribor, Slovenia. European Team Chess Championship 2021 was awarded to the city of Bled, Slovenia. European Amateur Championship 2020 was awarded to the city of Durres, Albania. The option to organise European Rapid and Blitz Championships 2020 was given to the city of Katowice, Poland, until the 31 st December 2018.